This evening something interesting happened. Something that hasn’t happened in many years in fact. Someone asked me some original questions about what I do. What circus skills do you do? How did you get into circus? I get pretty bored answering those questions. But I can’t not answer them; that would be rude. So I have to recreate the questions as if it was the first time I’d ever heard them, and answer them as if I’d never answered them before. But it’s tiring. Sometimes I just think I should make something else up. I long for someone to ask me original circus questions. If I were a trapeze artist, what three qualities should I look for in a catcher to be sure that they won’t drop me? If I were a trapeze artist, what age would I peak? What do circus artists do to relax and unwind? What original circus questions do you have? Between blog posts you can hear what I’m saying on twitter if you like. In case you were wondering, the three qualities I said I’d look for in a catcher were 1) strength 2) being present 3) trustworthy. Since Monday I’ve been in New York. Yesterday afternoon I went into the city and met Susan Voyticky. Susan is an old friend who also went to Circus Space with me in 1999. Susan took me to New York Circus Arts, which opened in September. 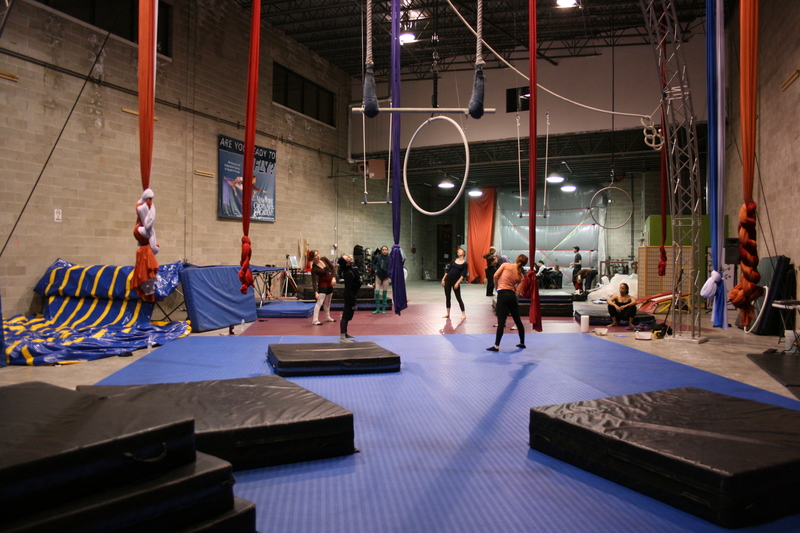 As far as I can tell, it’s the only dedicated circus training centre in New York – which is slightly hard to believe! New York is one of the biggest cities in the world but has an incredibly small circus community. New York has a thriving arts scene but hardly any circus. The first thing that struck me as we walked through Queens was NYCA’s sign that can be seen from the street. For a long time Circus Space has struggled with ways to promote itself but Circus Space’s location is prohibitive for such a prominent sign. 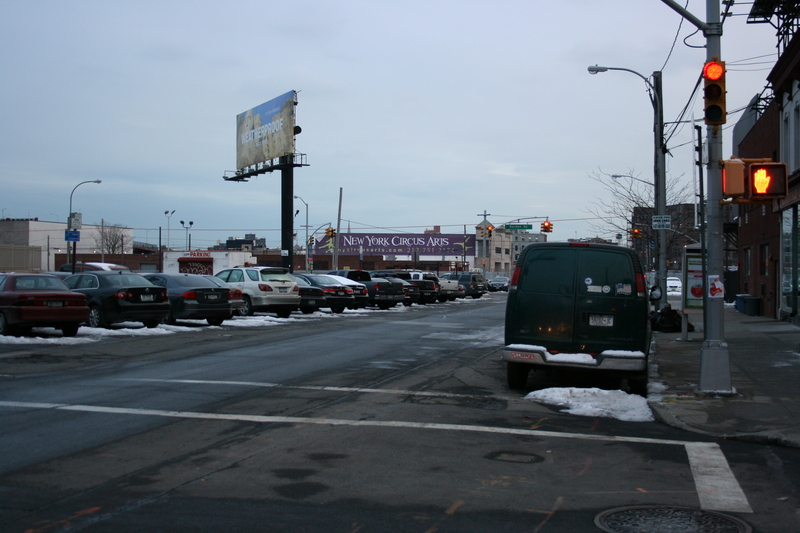 NYCA has a location that can accommodate a large outdoor sign that can be seen from a long distance. And it works. If you’ve been to the Hangar Arts Trust in London it’s fairly similar. NYCA is also in an industrial unit on an industrial estate. It’s one large training space. 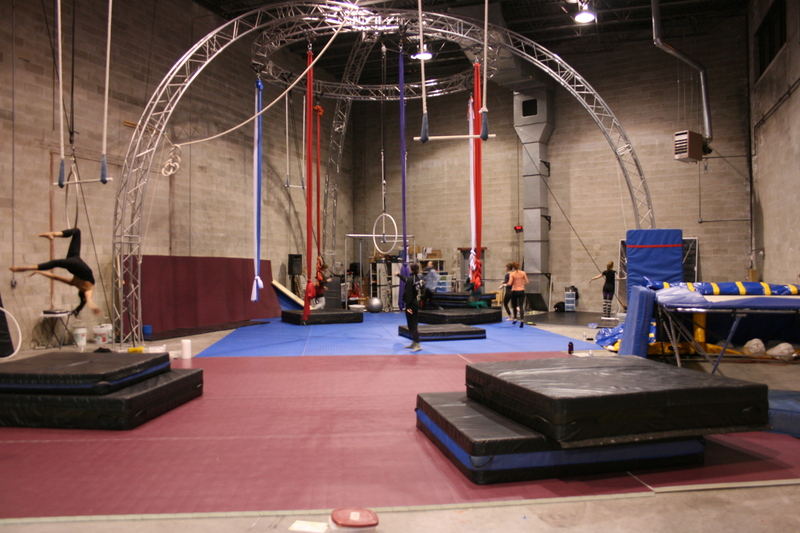 They have a trampoline with an inflatable pit, a custom-built free-standing arched “spider” rig, a small dance area, and mats covering a large sections of the floor. As a brand new circus training centre it’s very impressive. Good equipment in a good facility, with some nice touches (a live-feed video setup, anyone?). Perhaps the NYCA is shooting a little high in some areas – they have a ‘gear store’ and their website states “After 10 years in the biz, we’ve learned a few things about gear” – but I think they should be shooting high. At this stage they need to be promoting themselves, swinging out, taking some risks, and making big promises. But then they also need to fulfil them. Nothing good ever came from playing small. While I was there, the centre seemed under-populated. Perhaps that’s because it’s new, perhaps it’s because NY has a small circus community, perhaps it’s because NYCA’s international reputation is poor. Or rather, the founder’s, Cypher Zero, reputation is poor. I don’t think that being known by “Cypher Zero” really helps him create a credible reputation – regardless of whether it’s his (now) legal name; it seems ostentatious or pretentious. It’s a bump in the road that you have to get past when you first meet him and I don’t think it lends itself to the credibility that he’ll need as a businessman running an arts organisation on the world circus stage (ring?). However, I’ve met Cypher on a few occasions over the years and he’s never been anything other than affable and enthusiastic. But in one of the biggest cities in the world, a city with almost no circus, he’s the one man who has taken it upon himself to create a Circus School and raise the level of participation of circus. And perhaps he’s the only man that could. Who Wants To Try Flying Trapeze? Tonight New York Circus Arts will be installing their new flying trapeze rig. And, even though the NYCA is not big and has only one training space, they’re installing a Grand Volant (a Big Fly rig). This could be both a good idea and bad. The bad thing is that it will take up a huge amount of real estate in an already limited training space. The safety net will span the width of the space, interfering with any other training; no other aerial skills (static trapeze, silks, corde lisse, etc) will be able to be rigged while the fly rig is up. And given that no one at NYCA currently flies this could severely interfere with the training of the already limited number of users (professional and recreational) that attend NYCA. The good thing is that having a flying trapeze is a huge attraction both for recreational users and corporate training. Without some kind of financial support, corporate events are one of main ways in which training centres such as NYCA can survive and support their other activities. I’ve been a flyer, I’ve taught flying trapeze, and the only people I’ve ever met who don’t want to try flying are people who are severely scared of heights or are obese and afraid of being able to hold their own weight – and more often than not they really do want to try it and they just can’t conquer their fear. And jugglers. If NYCA can get a good flying trapeze teacher, some regular and talented students, and sell themselves as a provider of unique and valuable corporate training in NY they could just be on to a winner. Having this kind of draw could be just the thing that NYCA needs in order to become a mainstay of the NY circus scene, and a financially secure circus training centre with a great reputation. And I hope it does. 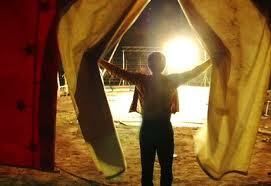 Keep up to date with Airborne Circus news, information and workshops. Copyright © 2019 Airborne Circus, All rights reserved.